It's been clearly known around the state about how people would love to see Head Coach Dave Walker and The Martinsburg Bulldogs fall and not win a seventh championship nor even make it to the championship. That won't be the case if The Bulldogs has the same talent that they have had year in and year out winning six state championships since 2010. The Bulldogs probably have the best coaching staff in the state. Last Friday, The Bulldogs won their 29th straight game by defeating The Loudoun Valley(VA.) Vikings 62-12. The Vikings are actually a class AAAA team out of Virginia. This game didn't really tell you how good The Bulldogs are for this season, because The Vikings went 3-7 last season as The Bulldogs won their 6th West Virginia Class AAA Championship. 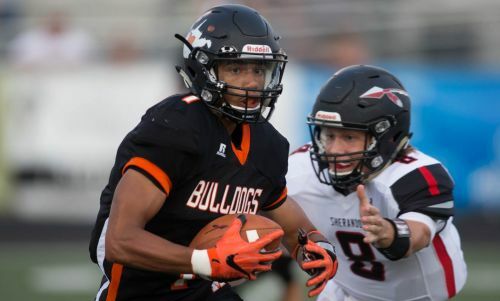 You'll see a better look at The Bulldogs Friday as they get a visit from The Woodson(D.C.) Warriors who actually opens up their season with Martinsburg. The last time The Warriors played The Bulldogs they went to Martinsburg and won 26-24 in 2015. Last year, The Warriors went 9-3 overall making it to the class AA semifinals. The Vikings of Loudoun Valley actually ran the opening kick-off back for a touchdown but missed the extra point making it 6-0. Jarod Bowie caught a 35-yard touchdown pass from Grant Harmon and the extra point was good making it 7-6 and from that point on The Bulldogs ran with a dominating lead scoring 55 points in the game. The Vikings would not score until 9 minutes left in the game when Luke Gillboy scored on a seven-yard rushing touchdown making 62-12. This will be a good test for The Bulldogs Friday to see where they really are as The Warriors of Woodson has produced a number of D1 athletes and is known for winning as well. Woodson(0-0) will travel from D.C. to take on Martinsburg(1-0). Kick-off is set for 7 p.m.